More Idaho elected officials are trying to keep anti-gun signs in place. 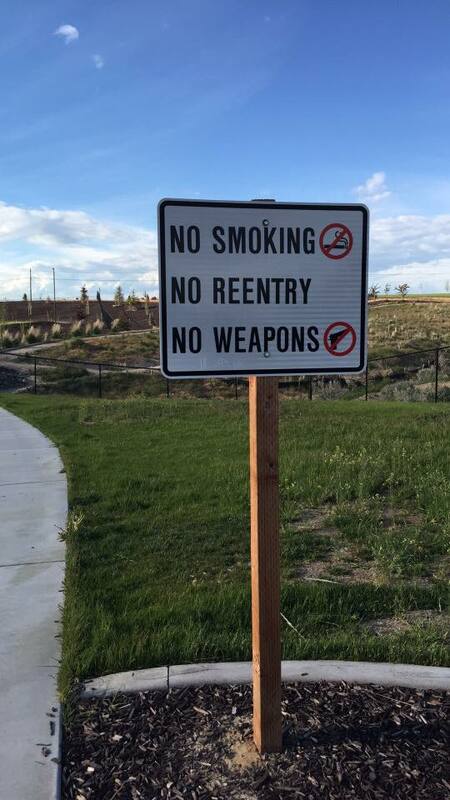 This time, the Bannock County Commissioners have thus far refused to take down an anti-gun sign at the Wellness Complex which is public property and ran by the County. We need your help to get the sign taken down. From the time the Idaho Second Amendment Alliance started the Preemption Project, we have helped over 60 cities and counties overturn illegal gun laws or take down anti-gun signs. Most of these cities and counties have worked well with the ISAA. A few however, have chosen an alternative route. Some have chosen to try and protect their anti-gun zones and have refused to make changes despite state law being very clear on the matter. Apparently, Bloomberg style politics haven’t completely escaped Idaho. We don’t have to look past the City of Chicago to see that these ‘gun free zones’ are completely ineffective at stopping crime. Chicago has become the deadliest city in America and one of the biggest ‘gun free zones’ in America. Except the criminals don’t seem to be deterred by these laws or signs. Is Bannock County trying to catch up to Chicago by keeping anti-gun signs in place? Why are the Commissioners not demanding that this sign come down? Idaho’s Preemption law (18-3302J) is very clear that Counties do not have the authority to regulate the possession of firearms. So, why then is the sign still up? Do you get to violate state law and get away with it? We first reached out to the county last month when concerned citizens notified us that the sign existed. The response from Bannock County was that they only wanted to keep the sign up while events were taking place at the theater and they would cover the sign up when an event was not taking place. We responded that the sign must come down and the law be followed. We asked the county to let us know if they would be taking it down. They have not responded to our inquiry to date. That’s why we need you to take action right now. >>> First, we need you to contact the Commissioners right away and tell them to immediately remove the anti-gun sign at the Wellness Complex. >>> Then, we need to inform the citizens of Bannock County about the Commissioners refusal to take the sign down. In order to do that, we would like to “Boost” a post from Facebook into Bannock County. Please chip in just $5 right away by clicking right here to help us mobilize Bannock County citizens and to inform them of their County’s decision to keep in place this illegal sign! We have only accomplished to many successes in the Preemption Project because of great citizens like you! You have stood with us and we greatly appreciate it. It’s time to stand again!